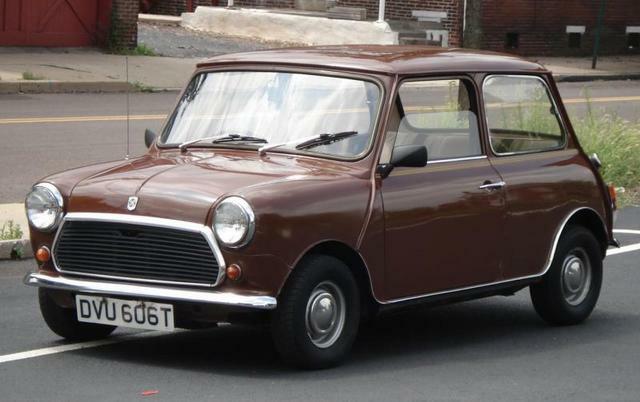 IMCDb.org: 1980 Mini 850 MkIV [ADO20] in "The Black Pimpernel, 2007"
Mini MkII or later, 1967 or later, probably, a lot later seeing a s the grille is no longer fully chromed nor the wingmirrors. Seeing the fact that tyhe film takes place in Chile, possibly licensed version such as Authi (Spanish licensed manufacture) or more likely, a chilean version as there was a Chilean manufacturor ( I will look for their name) that was licensed to build these as well..
K, so in Chile they were manufactured under either the Rover or Morris name, but with the interesting difference that they were all Fiberglass bodied, build at the end of the 60's. Mk 4, about a 1980 with that BL badge in the middle of the grille. I had my doubts... but I have to agree with dudley. By adjusting the contrast it is just possible to see what looks like a badge in the correct position on the grille. seeing as it is that young, it is definitely not the locally build version..
Don't know why, but probably to create a 'family look' with the 1980 launch of the Metro, which also had its BL badge in the middle. http://www.aronline.co.uk/index.htm?chileindexf.htm has the story of Chilean assembly of BMC products, including the fibreglass Mini and MG1300 Mk2 [ADO16] in late 60s until 1974. UK Mini 850 and 1000 were then imported by BL Chile until 1984 (possibly badged as Austin though Mini was the make elsewhere) when BL left Chile. Imports resumed in 1992 as Rover (alongside 414 Si 16v and 600 and 800 ranges, plus Land Rovers and some Jags). This Mini looks to me an 850 [ADO20] of about 1980 as argued previously (so close to the end of 850 production) - more detail visible in /vehicle_182643-Citroen-2CV-1973.html . Would be useful if anyone can confirm if Chile still used Austin name at this point.